The earlier work incorporated into the newer work is called the underlying work. Although an unpublished screenplay often forms the basis of a film, once the film has been published, the portions of the screenplay “published” within the movie are no longer “unpublished.” Producers retain the right to non-published story elements, unused dialogue and actions described in the written version. Pre-existing work such as advertisements in a magazine, television program, etc., are not copyrighted as part of the larger work in which they appear. Advertisements may be copyrighted separately. Works copyrighted 1978 and later are covered by law that reserves to copyright owners the right to create certain derivative works including translations and dramatizations. Prior law had given purchasers (e.g., publishers, movie studios) greater licensing power. If a copyright holder of an undelrying work is or may be a foreign entity, be sure to read the “Foreign Works” section of the tree-view chart and illustrations page on this web site. Although a work may seem to be an American work that has fallen into the public domain, when an alternate version is marketed as though the original and copyright can be claimed by a foreign entity, that entity may be able to enforce copyright on the versions most frequently offered. Has an alternate version of the underlying work been offered as a part or the whole of a new work? Has material that was created for but entirely removed from the underlying work (and, thus, not part of the copyrighted entity) been offered as part of or the whole of a new work? Questions such as these arise when dealing with derivative works. One court case that dealt with the tangle of rights entailed when there were four versions of a work (one original and three derivative works) concerns Madame Butterfly and is summarized on the Citations and Case Summaries page on underlying copyright. This link brings you to the summary, beneath which is a graphic showing when each of four versions was under copyright. illustration: Advertisement for Paramount’s 1932 movie version. 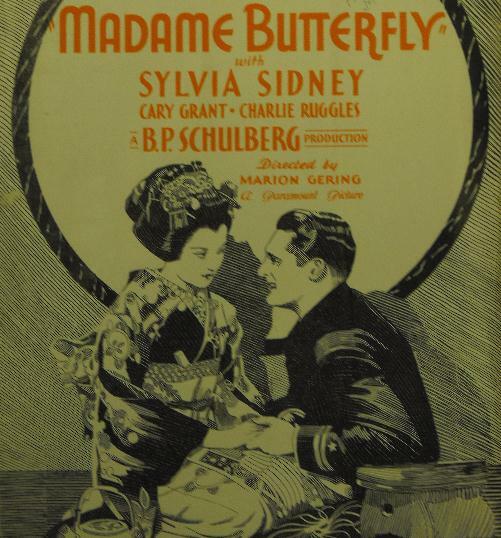 Madame Butterfly was already famous as a novel, a play and an opera. The copyright to the 1940 release His Girl Friday was not renewed. However, no one attempting to offer unauthorized copies of it could do so without encountering a credit indicating that the film is based on the famous 1929 play The Front Page, which was renewed and is still under copyright. His Girl Friday opens with mostly-new scenes establishing a new story element. After that, His Girl Friday follows the story of The Front Page pretty faithfully, with a majority of the dialogue copied verbatim. Any copying or showing of the whole of His Girl Friday entails use of the copyrighted play. The movie I Cover the Waterfront (1933) was not renewed. It, too, credits an earlier work (the one that might be considered the underlying copyright). The copyright to the 1932 book has been renewed and remains in force. (Note: the title screen pictured above is from a reissue. The copyright notice is believed to have been more formal on the original.) Comparison made between book and movie by the proprietor of this web site revealed that the movie used little from the book. Although Claudette Colbert was billed first, her character appears nowhere in the book, nor does any woman character remain in the narrative for more than four pages. The main storyline of the movie was invented for the movie. A small number of observations made in the narrative of the book are spoken as isolated lines of dialogue in the movie. 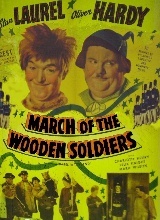 The 1934 movie Babes in Toyland was reissued two decades later as March of the Wooden Soldiers. No copyright was taken out on the reissue title, but the original copyright as Babes in Toyland remained in force as underlying copyright. Information filed in the Copyright Office by a rights-holder establishes a public record that the later title is essentially a new name for the earlier work. Implicitly, the filing puts would-be copyists on notice that the copyright on the 1934 movie of Babes in Toyland also covers the 1950 retitled version. The documentation is discussed in the illustrations page on Researching the Copyright Status of a Work. Walt Disney’s Mickey Mouse cartoons were so popular while they were being made in the 1930s (the first was released 1928) that Disney could license them for copies sold directly to the public. The editions sold this way were shortened to about five minutes each (from about eight originally), had already been shown in theaters, and were on a smaller film stock with a less-detailed picture area than the originals. The ad above appeared in an industry trade magazine issue dated October 1, 1932. 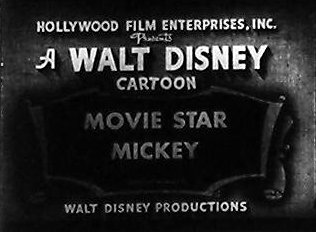 Mickey’s Gala Premiere is identified in the Copyright Catalog as 15th in the Mickey Mouse series, and copyrighted June 6, 1933, registration number MP4293. When adapted for the home-movie edition, the abridged version was titled Movie Star Mickey. No copyright was filed under the title Movie Star Mickey, so some misguided distributors have assumed this film to be in the public domain. However, all of the content — other than the new title card (shown above) — derived from Mickey’s Gala Premiere and so has enjoyed copyright protection under that title since 1933. The Disney company can claim copyright on Mickey’s Gala Premiere regardless of what title the cartoon goes by. The 1939 movie serial Buck Rogers was re-edited from its original format of twelve chapters of about 20 minutes each, to a feature film of about 70 minutes titled Planet Outlaws issued in 1953. (Yet another feature-film abridgement was titled Destination Saturn and runs about 80 minutes.) The opening credits to this feature list as underlying source the comic strip upon which the serial film was based but not that earlier film. The 1938 serial was under copyright when this feature film was prepared (and the serial remains under copyright through renewal), yet this feature version is a public-domain work. However, no one can lawfully copy the bulk of the feature without infringing on the copyright in the underlying movie. The frame at the right, above, is a scene newly-shot for the feature to help introduce the pre-existing scenes. The man with the headset opens the film by talking to the audience about advances in space exploration, which provides a springboard for him to state that such exploration was anticipated by creators of such fiction as the audience was about to see. Just as the scene with the headset-wearing story-teller is unique material in a work that otherwise is composed of material copyrighted within other work, so too are some shots in movie coming-attractions trailers. What is different in trailers is that the unique material was created in the process of producing the main work. A scene from a movie that also appears in a coming-attraction trailer can be regarded as enjoying the copyright protection of the movie, in cases where (as is common) the movie was copyrighted but the coming-attraction trailer was not. 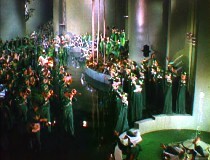 This scene, having not been part of the movie as copyrighted, does not enjoy status as part of the underlying work represented by the trailer. The fact of the novel Adventures of Huckleberry Finn becoming available in 1996 with passages previously deleted, is recounted in the illustration page on publication. Had the publisher with the exclusive rights to the “new” (that is, previously-unavailable) material merely published that new material by itself, the book so marketed would have obviously been an entirely-new work (insofar as copyright registration is concerned). Instead, the publisher wisely incorporated the “new” matter into the old, identifying the new matter as such, and letting readers have their choice of (a) reading the new material by itself (skipping pages where necessary), (b) reading the new material and old material as a continuous whole, or (c) reading just the long-beloved portions which the author in connection with his original publisher decided to make available. The copyright registration for the “new” edition distinguishes what within the new, longer book is entitled to copyright as opposed to the older contents on which copyright was already issued and no longer available. above: front page of registration; below: back side of the same registration. The publisher of the 1996 edition of Huckleberry Finn also took out a copyright registration on the new introduction (below), doing so in the name of the author of that introduction rather than in the name of the publisher which contracted to make available the unpublished portions of Twain’s manuscript. Above, Random House claims proprietorship over the material gleaned from the unpublished portions of the 112-year old manuscript but not to the introduction, thereby giving the author of that introduction greater opportunity to exploit his work elsewhere. above: front page of registration on introduction; below: unique parts of the back side of that registration. Duplicative and unnecessary aspects of the back side are not reproduced here. The Adventures of Huckleberry Finn was originally published in different form in 1885 by Charles L. Webster and Company. illustration above, like the earlier illustrations from Adventures of Huckleberry Finn reproduced on this web site, copied from a 1912 edition. The illustrations page on foreign works discussed that when the Fractured Flickers television series was made in 1963 and 1964, no copyrights on some classic German films such as M and Blue Angel (both 1930, neither renewed after 28-year U.S. copyright reached their ends) were recognized in the United States. The creators of that series did not have to license the films in order to incorporate excerpts from them within the series. An opposite situation existed with respect to many of the classic Buster Keaton comedies of the 1920s excerpted within the series. Most of the Keaton films were renewed, and these were licensed to the creators of Fractured Flickers by the rights-holder to the films, Raymond Rohauer. Anyone with access to the Fractured Flickers programs who, while the program was new and under copyright, sought to extract uncopyrighted material from the shows by carefully not copying the new credits, new titles, new soundtrack, and new host introductions, would still have to be careful not to reproduce portions of the Keaton films still under copyright. At the time that the programs were new, most of the film clips were in the public domain, including those clips from scores of American silent films, some foreign films, and even a handful of the Keaton shorts which failed to be renewed even when the bulk of Keaton’s work was being given second terms. At the end of 1989, it might be argued that the Fractured Flickers series entered the public domain. (One copyright notice on each program is dated 1961. See the illustrations page on copyright notice. The copyright registrations on the programs were made a later year, and based on that year no renewal was made that was timely for a 1961 start date. An argument could be made in support of a later date as the start date. A similar situation concerning a different television series is examined on the exercises page.) Should this be the case, it remained the case that the 1920s Keaton excerpts protected by underlying copyright in 1963 and 1964 continued to be protected by copyright in 1990. On the last day of 1995, the copyrights for 1920 American works entered the public domain, having reached the 75-year maximum combined term which at that time was the limit. The copyrights on the 1921 and 1922 Keaton works followed this entry into the public domain at the ends of 1996 and 1997, but the passage of new legislation in 1998 extended the duration of all then-valid copyrights for another 20 years. It remains the case that the renewed 1923-1926 Keaton films incorporated into Fractured Flickers represent underlying copyrighted works within that series. Add to this that starting January 1, 1996, the 1994 URAA/GATT legislation resulted in revived copyright status for M and Blue Angel. Pardon Us is used as an example on the illustrations page on publication, where it is explained that the film was previewed in a version containing scenes excised from the release version. The release version can be considered “published” but the version previewed — shown to limited audiences, never sold, existing in only one copy at a time — can’t be construed as published. The illustrations page on publication details the differences, and indicates that when the portions excised from the preview version were reinstated into the completed film, combining them with scenes that weren’t added until after the first previews, the new combination (released to home video and shown on television) amounted to a new derivative version. Click the link for further information. The Copyright Act (1976 version, §409) states that, “in the case of a compilation or derivative work,” the copyright registration must include “an identification of any preexisting work or works that it is based on or incorporates, and a brief, general statement of the additional material covered by the copyright claim being registered.” Creators tend not to repeat this information within the work itself, particular not in a conspicuous location. (For a book, a conspicuous location for such information would be on the inside of the title page, near the copyright notice and publication information.) It’s as though authors will grudgingly fulfill their duties to disclose the information on the required governmental application but withhold it where the law does not compel them to divulge. An exception to this — and one illustrative of how a web site can disclose its public-domain sources — is the works of Peter Tchaikovsky searchable database website at https://tchaikovsky.dhwritings.com/. Descriptions in Chaikovskii: Life and Letters were supplemented in several respects. That work failed to provide opus numbers for several works that have them, so those numbers have been incorporated here. Facts not provided by the 1906 book supplement those that are; paragraphs consisting of substantive new remarks are accredited to this web site’s creator (where he has supplied them). Lesser remarks are not so accredited, but those tend to be confined to brief remarks about developments that had not yet happened when the John Lane Company published its book. Anyone reading here about a reconstruction done in the 1940s or completed in 1956 should know that the 1906 appendix could not have conveyed these facts, and, therefore, readers shouldn’t question that these remarks have been incorporated by the later author. No author other than this web site’s creator served as intermediary for the 1906 text, of which this author was working from a 1906 copy. Tchaikovsky by Herbert Weinstock, published 1946 by Alfred A. Knopf, was the source of the “Music Category” information. Although the “Catalogue of Works” in that book included much other information, there was little that was not duplicated elsewhere. Descriptive information on this web site that is not quoted verbatim from Chaikovskii: Life and Letters typically is paraphrased from several sources, mostly inset booklets included with compact-disc editions of recordings of Tchaikovsky work. The principal area in which Chaikovskii: Life and Letters was supplemented was that of student works and student-era works of Tchaikovsky. These were ignored in his brother’s chronology and are little available (even when they survive). The second area in which the 1906 source was supplemented was in English translation of song titles. That book’s translator, Rosa Newmarch, stated in a footnote, “As several English versions exist of many of Tchaikovsky’s songs, and some of these so-called translations have not even titles in common with the original texts, it is less misleading to keep to the German titles.-R. N.” As wise as her decision may be, the operator of this web site believes that its principal users are conversant in English, and therefore English translations are provided. Users are warned that titles may be inexact or non-exclusive. only concern aspects of these works relevant to Derivative Versions.